The long and winding road that has been the Longbox Graveyard has taken some unexpected side trips. When I began this blog I intended it only as a means of keeping myself on track as I cataloged and sold off my Accumulation of unwanted comics. But a funny thing happened on the way to eBay … I started reading my comics again, and found that I kinda sorta still liked them. After decades away from funny books, suddenly I was hip deep in the buggers, not only reviewing favorite books like Conan and Thor, but also looking at newer series like Ed Brubaker’s run on Captain America, and even exploring the intersection of comics and technology with books like Operation Ajax and the vintage comics on offer through Marvel’s Digital subscription service. Surprises all! What I never expected — with so many issues of Master of Kung Fu, Fantastic Four, Batman, Daredevil, and Swamp Thing as yet unexamined — was that I would devote an entire column to Marvel’s Godzilla. Inspiration comes when you least expect it. There I was, arguing the merits of John Carter with fellow blogger Mars Will Send No More when the conversation turned — as it will among learned men — to the merits of fictional T-Rexes. Before I knew it I was committed not only to reviewing Godzilla, but also to participating in a March Madness T-Rex Beat-Down tournament (for the results of which, mouse over to Mars’ blog). Mars and I don’t always see eye-to-eye, but I echo his blog comments excluding Godzilla from our tournament, and not merely because Godzilla isn’t a proper T-Rex. As Mars put it, “… Godzilla annihilates everything, everyone, everywhere, always. And any story where he didn’t is a lie.” Godzila is an outsized character who can’t help but dominate any scene he enters, whether he’s sharing the stage with a field of cinematic dinosaurs or the headline characters of the Marvel Universe. And so what of Marvel’s Godzilla? Does this big green galoot annihilate everything and everyone, everywhere and always? Or is Marvel’s version of the King of Monsters a big pile of lies? My plan was to review just those Godzilla books I had in the Accumulation — issues one to six or so — but after the first half dozen books I found myself unaccountably caught up in the admittedly thin story. So rather than dump my Godzillas for pennies on eBay, I instead went into WonderCon determined to fill out my run, but found that the dealers on the convention floor thought their Godzilla back-issues were worth ten bucks a pop. Hey, I like the book, but there’s a limit. My first impulse was to review what I had and offer the first “incomplete” grade on the Longbox Graveyard report card, but then thirteen bucks and a trip to eBay secured a copy of the black & white Essential Godzilla, and the great Godzilla review project was on once more! So what was the deal with Godzilla, anyways? The year was 1977, and Marvel would try just about anything, including adding the Godzilla license to the Marvel Universe. What could have been a disaster was instead a workman-like book in the tradition of late 1970s Marvel, where solid editorial standards and dependable mid-list talent ensured a firm floor for the entire comics line. It’s rare to find a truly dreadful Marvel book from the late 70s, and thanks to an energetic effort from the Doug Moench on scripts and a professional job from penciller Herb Trimpe we have two years of Godzilla books that for the most part deliver the goods — neither very good nor very bad, but always entertaining and probably better than the series had any right to be. A snappy first issue introduces Godzilla to the Marvel Universe (and you can read that issue online, in it’s entirety, over at Mars Will Send No More). It does feel like Marvel was hedging their bets, at least at first. 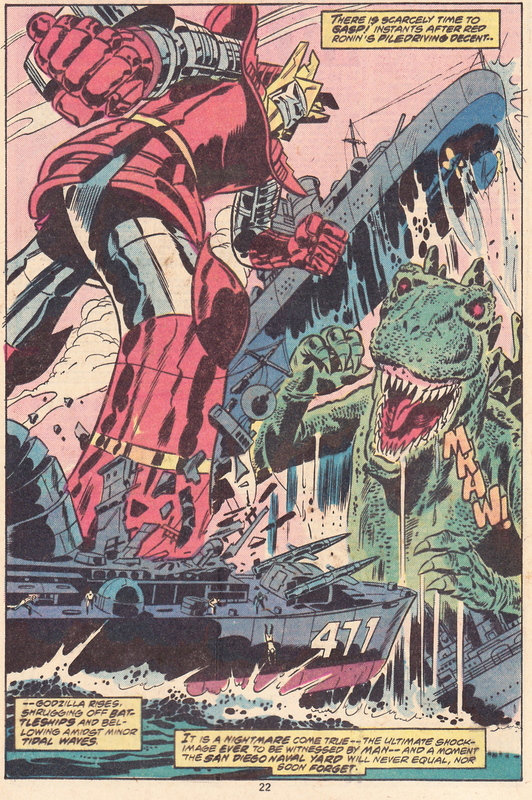 Pitting Godzilla against S.H.I.E.L.D. was an inspired choice, but we get the S.H.I.E.L.D. 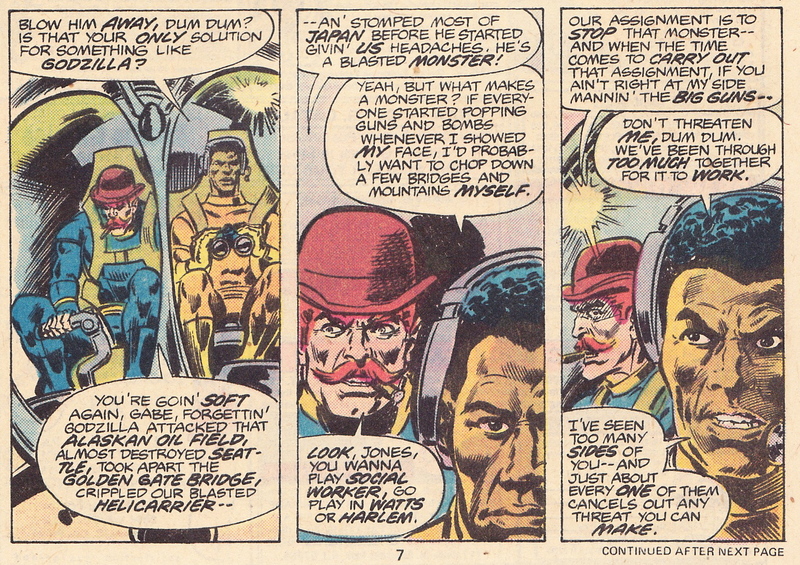 B-team here, with secondary Helicarriers commanded by Dum Dum Dugan rather than the iconic Nick Fury. When Godzilla stomps Alaska, Seattle, San Francisco, and San Diego in short order, it really should get the attention of the Avengers and Fantastic Four (but we will have to wait until the end of the series for that moment). Rather than scrambling even the B-team Defenders to the rescue, we get the forgettable Champions for a serviceable superhero battle with the Big G most memorable for Hercules taking down Godzilla with a judo flip. The Marvel Universe has always been New York-centric, but you figure it would get national attention when Godzilla destroys Hoover Dam, stomps Las Vegas, and wrecks Salt Lake City during a battle with bizarre space monsters … but Godzilla is still regarded as a hoax when he finally makes it to Manhattan in issue #20, and only then do Marvel’s most iconic heroes scramble for a pretty decent superhero fight against Godzilla. But I’m not sure Moench could have handled Godzilla any other way. 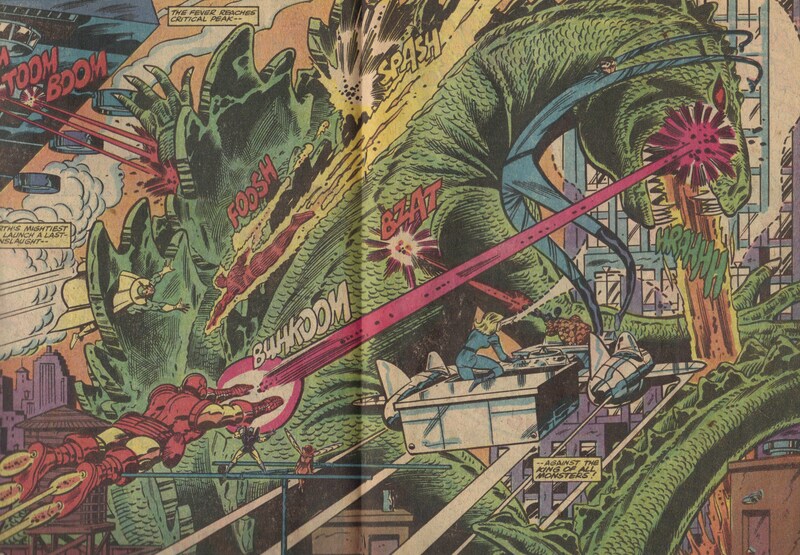 In contemporary terms, Godzilla attacking the United States would warrant a summer’s worth of Marvel Comics cross-overs, bleeding into every book in the line, but in 1978 Moench and Marvel elected to keep Godzilla partitioned in his own little bubble of the Marvel Universe. 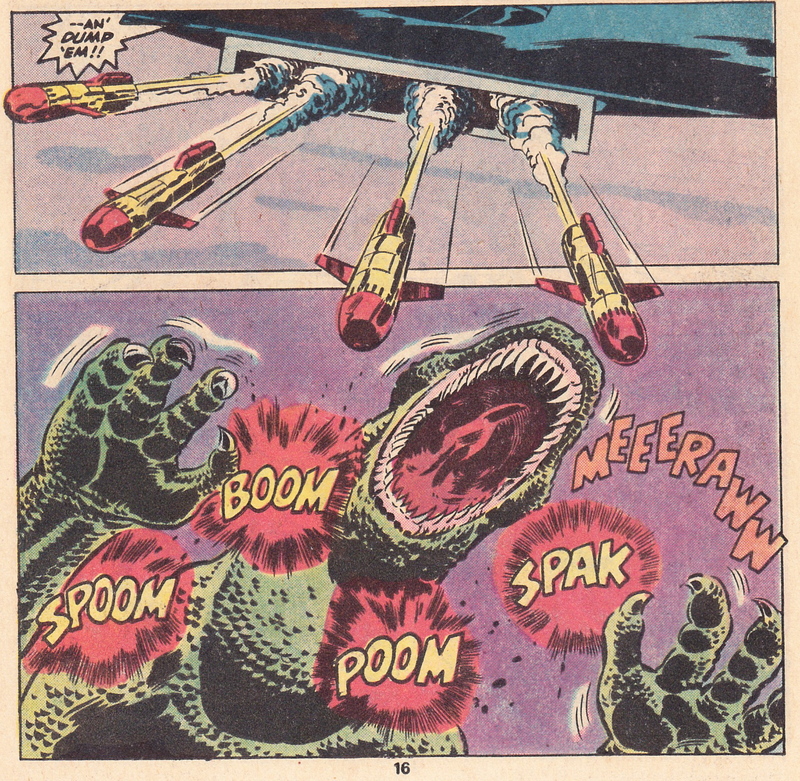 The only alternative would have been to go right at it — to deeply integrate Godzilla in the line with increasingly improbable cross-overs every issue, which would have been a hoot with an absurdist writer like Steve Gerber or David Anthony Kraft, but there’s no way it could have been a sustainable premise. 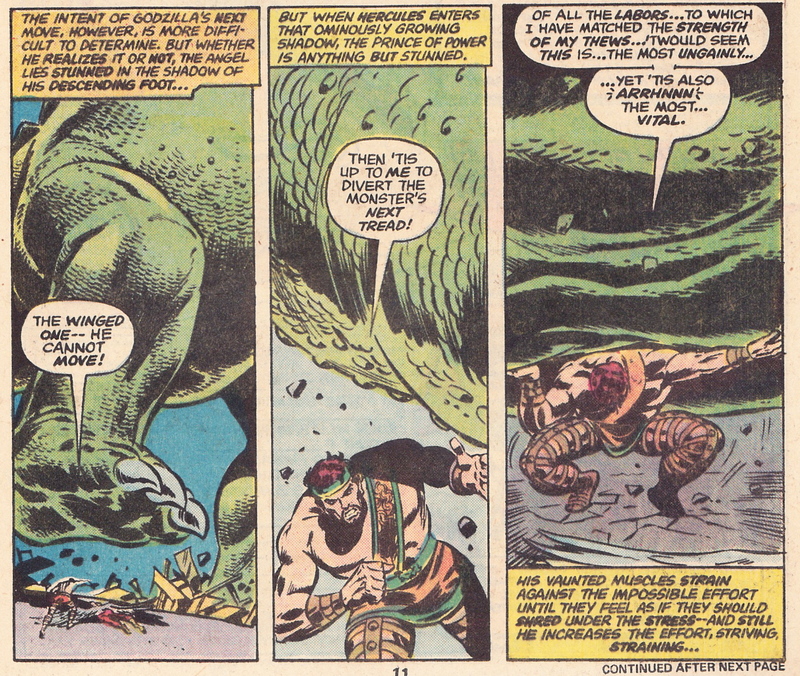 Instead, Moench went to the Marvel monster playbook, adopting the tropes on display in books like Man-Thing, Tomb of Dracula, and even Hulk, where his title character is a remote and sometimes unfathomable anti-hero, while the subplots and characterization revolve around supporting characters trying to help or hinder the star of the book. And this proves one of the weaknesses of Godzilla. Along with the aforementioned S.H.I.E.L.D. back-up squad we have a team of generic Japanese scientists trying to stop Godzilla, including a twelve-year-old boy who (of course) bonds with a giant robot to fight the monster that he is convinced is good at heart. In the first year of the book, Moench also gets some play out of examining Godzilla’s motivation. Is he a rampaging monster, or a misunderstood victim? The cast eventually comes down on Godzilla’s side, but Dum Dum Dugan needs some convincing. The second year of the book is a little more whimsical, and while the plot contrivances of pitting Godzilla against cowboys (in a distant echo of Valley of the Gwangi), or having Godzilla shrunk down by Hank Pym’s reducing gas to fight rats in the sewers of New York will make Godzilla purists apoplectic, I found the less leaden tone of these later tales more entertaining. The last half of the book also gave me a renewed appreciation for Herb Trimpe, about whom I always thought the best I could say is that he wasn’t Sal Buscema. Trimpe struggles with facial expressions — Dum Dum’s cigar pops out his mouth the hundred-odd times he wears his “surprised” face, which is identical to his “angry” face. 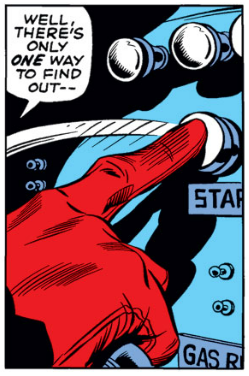 There are plenty of those recycled Trimpe panels where a character’s foreshortened index finger fills half the frame, as someone points, blank-faced, at something happening beyond our view. But Trimpe has real strengths when it comes to draftsmanship, and the backgrounds of his New York are appropriately detailed and authentic. The two-part western interlude also let Trimpe draw horses — Trimpe got his start doing western comics, and he draws good horses, something that’s not as common among comic book artists as you might think. And he pulled off the odd inspired Godzilla panel, too. In all, Godzilla does what you’d expect. Our hero stomps a bunch of cities, and he battles but is never really beaten by S.H.I.E.L.D. and Marvel’s superheroes. He crosses-over with Devil Dinosaur, fights a sewer rat, and he shares a panel with Spider-Man. He’s at the center of some ridiculous story lines (at one point reduced to human-size, led around the New York Bowery in a hat and trench coat! ), but it didn’t bother me as I’m one of those ignorant gaijin who finds it hard to parse “Godzilla” and “quality” in the same sentence. No matter these indignities, Godzilla emerges from his weird, twenty-four-issue Marvel odyssey with his reputation intact, clearly still King of the Monsters, and having delivered a solid, entertaining run of comic books. In all, Marvel’s Godzilla isn’t a bad read. I won’t tumble to the inflated prices those WonderCon guys want for this book, but I’d happily fish an issue or two out of the dollar box, and the out-of-print but readily-available black & white Essential Godzilla is an inexpensive way to experience this series for yourself. 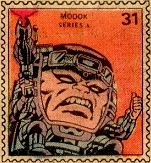 Where else where you see Thor bonk Godzilla on the nose with his enchanted hammer? Yep, that happened. Godzilla really was part of the Marvel Universe! A second-class citizen, sure, and this might seem a second-rate book. But Godzilla is not a second-rate effort. Sometimes comics are art, but most of the time comics are just comics, and as a guy who wrote a lot of inventory assignments himself, I have genuine admiration for the team that turned in such consistent effort along the way to bringing this self-contained run to a satisfactory conclusion. I doubt I’ll go back to this series, but I’m happy to have spent a couple nights with Godzilla, stomping through the Marvel Universe. Hail to the King! Posted on April 11, 2012, in Reviews and tagged Doug Moench, Godzilla, Herb Trimpe, Marvel Comics, Marvel Universe, Monsters, S.H.I.E.L.D.. Bookmark the permalink. 56 Comments. Between Magneto, the giant octopus from It Came From Beneath The Sea, and the Big G … you’re right, that’s enough for a space program right there. I understand it cost $6M just to clean up the monkey crap from Rise of the Apes last year! I’m so glad to see one of my favorite series from when I was a kid, finally getting some love. 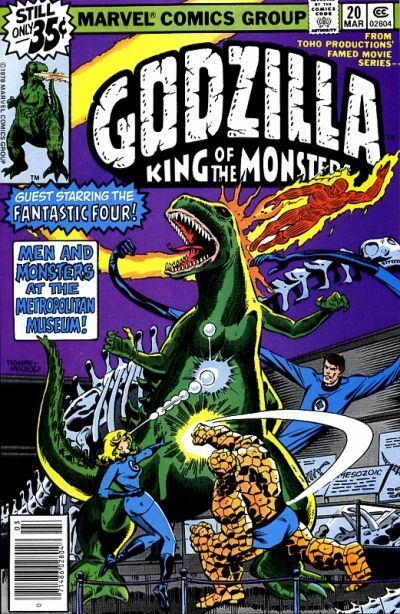 Most things I read about Marvel’s Godzilla, talk about how silly it was, and how Godzilla “didn’t look right,” or how it was “Godzilla fights the monster of the month,” or something. Well, yeah, but, they’re missing the point. You get it, and, to a 9 or 10 year old kid in 1978, they were pretty awesome! Yeah, I knew Godzilla didn’t look exactly like he did in the movies, but he looked good enough, and what else was Godzilla supposed to do, if not fight other monsters every month? This comic did exactly what it was supposed to do. It entertained the hell out of me and my few other friends who read comics, and it (along with Star Wars) sucked me into the larger Marvel universe, and turned me into the collector I am today, which, I understand, was one of the goals of licensing those two properties in the first place, so I’d say mission accomplished for Marvel! Yeah, I read them now, and the plot holes and other silliness like you pointed out, are more obvious than when I was a kid, but I still enjoy them immensely. They’re really very well done. And every time I read or hear someone slagging Herb Trimpe, I imagine they’ve never looked at this series. It also introduced me to SHIELD, and I’ve been a Dum Dum Dugan fan ever since! Hey, Crowdaddy, thanks for reading and the comment … I hope you’ll sub to the blog, as I suspect more of your childhood will show up here sooner or later. I have Super-Villain Team-Up — another “good” bad book from this era — coming up in a couple weeks! These Godzilla books were better than I remembered. I never really tumbled to them in their first run — I was a teen when these books were published, and as much as I liked Godzilla, the series just fell off the back of my budget every month — so my expectations were limited coming back to them as an old fart, but as I opined in the blog, the series got a lift from a throughly professional effort from Doug Moench, and it even helped me appreciate Herb Trimpe (to the point where I’m ready to look at some of the Hulks he did with Roy Thomas). There was a quality of fun to these books not always so evident in the more mainstream books of the era, too. I think I’ll keep these Godzillas, though. I left them out in my 12-year-old’s room, as a kind of cultural booby-trap, but I don’t think he’s stepped in in yet. Patience. I have to say, Paul your path sounds a bit like mine. A couple of years ago I started pulling out the long boxes and re-reading my old comics, which I hadn’t done in about 20 years, and this even caused me to buy a few new ones. I wish I’d had the idea to start a blog about it, though I’d probably have been too lazy to follow through with it, anyway. Keep up the good work! It’s never too late to start a blog (and I will happily plug your effort if you decide to do it). I can say with confidence that I would have abandoned my comics project if it weren’t anchored by this blog — now I am approaching my one year anniversary, and fully intend to keep Longbox Graveyard going for at least another six months. A fully assessment of my progress must await this summer’s “Longbox Soapbox” entry but I am finally getting a little traction in selling my books, and I am largely satisfied with my organizational efforts, too. There’s have been collateral benefits, too, not least of which has been to meet new correspondents, a renewed interest in comic conventions (and hosting panels), oh, and reading some comics, too. I highly recommend regular comic book blogging as part of your nutritious four-color breakfast! Now you’ve got me in the mood to buy some old Godzillas! I only bought one issue of Godzilla back in the day, as I was really only into superhero comics, but I’ve been thinking that I’ve been missing out on some good entertainment. I recently bought a few issues of Shogun Warriors out of the dollar bin. I don’t blame you for not buying Godzillas for 10 dollars a pop. That’s outrageous. I’d have figured them to be candidates for the dollar bin. Congrats on getting the Essential to finish up your collection, though. It looks like a reasonably entertaining run. The dialog between Dum Dum and Gabe is a nice moral dilemma, and the superhero crossovers look cool. I looked it up on comicbookdb.com, and it looks like after Godzilla’s run ended, he next appeared in the Marvel Universe in a few issues of Irona Man in 1985, and one issue of The Thing, then he was gone form the Marvel universe. You’d think if Marvel owned the rights to him in that 6 year interem, he’d have shown up at some point. Odd. Godzilla and Shogun Warriors are perfect dollar box books as far as I’m concerned (or two dollar box, actually, haven’t seen a dollar box in a long, long time). It’s an example of a series that is worthless when you try to sell it, but expensive when you want to buy. The Essentials volume was a good candidate, despite its cheap black-and-white printing and a binding that self-destructed when I took the book out of the mailing envelope. That Essentials volume and the few original books that I own are still on my twelve-year-old’s dresser, unnoticed and unread. I think it’s a lost cause but hope springs eternal. It’s funny you should mention Shogun Warriors, because I did recently buy a few issues from the local dollar bin! I still haven’t gotten around to reading them, though. “worthless when you try to sell it, but expensive when you want to buy” is a funny, but true statement. Of too many comics, actually. Good luck getting your 12 year old into some quality comics. I’ve got an 8 months old, so I’ve got a while to work on him. Jack’s been to see Avengers three times now, so I am working that angle, feeding him old George Perez books and hoping for the best. He can pick Ultron out of a lineup now. Recognizing Thanos from the movie and on the cover of Infinity Gauntlet earned him a copy of that particular graphic novel. George Perez is a pretty good way to get someone hooked. My first ever superhero comic was a Perez Fantastic Four issue form 1976. I used to read Marvel’s Godzilla comics, and I did get a strange satisfaction out of seeing him outwit Dum Dum again and again. Of course, stomping his way down the Pacific Coast and ultimately to New York was fun to watch. 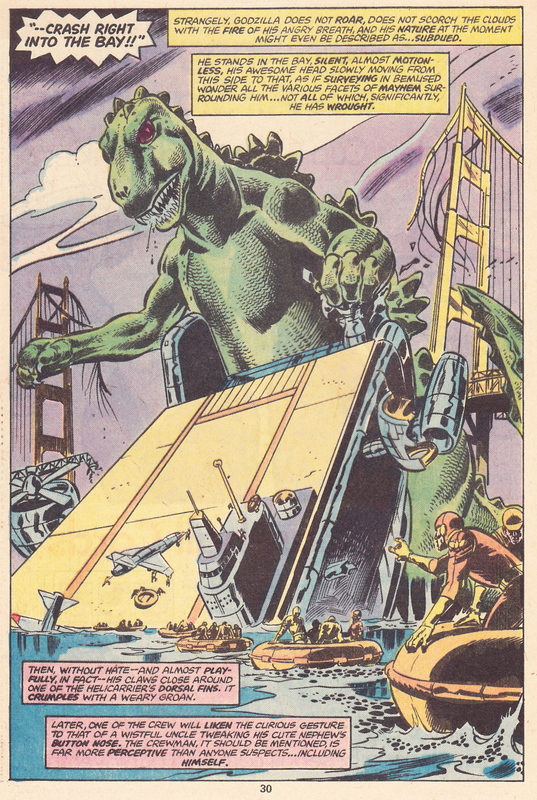 I did find it strange years later, after rediscovering the comic online, that Marvel opted not to spread Godzilla over various crossovers with other lines in an epic slugfest like with Thanos or the Beyonder, but I’ll agree with you that Moench and Co did a respectable job in bringing the King of the Monsters to Marvel’s lineup, at least for a little while. Thanks, Paul, for this fun little trip down memory lane and Happy New Year! Moench and Trimpe both turned in workmanlike jobs on an assignment many creators would have blown off … I think they did about as well with the book as they could, and while greater integration with the Marvel Universe would have been welcome, in the end I suppose I should be content with the minor miracle that resulted in Godzilla running amok in Marvel’s Manhattan. Glad you still have them, these issues are a bit more expensive on the back issue market than your usual late-Bronze Age Marvel book. My black & white Essential collection is a poor substitute for the real thing. I just bought the issue where he fights The Champions for one of my best friends for Christmas; I also got him the complete run of Champions! That’s gonna be a fun night for him! That’s awesome! Will you be my friend. 🙂 I love the short lived, quintessentially Bronze Age titles. I bought The Marvel Masterworks The Champions volumes 1 & 2, and I’ve managed to track down almost the whole run of The Shogun Warriors (I used to own the action figures back in the day) from the dollar bins of a couple of local comic shops. You guys are killing me with the Champions. Those guys make the Defenders feel like A-listers! I keep bouncing off the art when I try to read that series. Who is it — Heck? 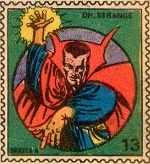 Frank Springer? Tuska? Someone. But I recall Byrne drew some later issues, in that time when he’d just joined Marvel and was doing Iron Fist and team-up books. I am unsure why my friends and I love The Champions so much, but alas, we do. The Champions should have been better than it was, but I think some of us are seduced by such an odd grouping of heroes. The odd lineup definitely has something to do with it. I also think the fact that they were isolated from other Marvel heroes helps as well. They seem to be so uncool somehow that they become super cool to my pals and I. I swear I don’t go 3 weeks w/o a Champions conversation with one of my superhero fan pals or my poor beleaguered girlfriend who has heard more about supeheroes than I am sure she ever cares to. I recall it was a radical notion to set a superhero team in Los Angeles, like all the New York-centric talent at Marvel considered everything west of the Hudson to be cornfields and mutant pastures. Yeah, that’s what I meant by isolation. I should have been clearer about that. I think they moved Daredevil to San Fran for a bit during this era, but otherwise most everything happened in NYC. Something about The Champions happening in LA makes them that much more special to me. I grew up in L.A. and was excited to have a super team of my own … but then they showed up in a clown car and adventured in some generic L.A. that wasn’t even as convincing as a Jack Webb TV show. Disappointed. I was cheering for Godzilla when he showed up. Gents, I write a comic book blog. That’s what you call a glass house. I don’t even throw marshmellows in here, let alone stones. If you love the Champions, my hat is off to you! This is the place to let that Champions flag fly! The thing is, you’re not really wrong to not like The Champions. The art, in particular, is awful,. and they never really seem to come up with a good reason to be together. There is an intrinsic charm here, perhaps similar to that of the so-bad-it’s-amazing movie The Room (although Champions is not nearly so bad or outright bizarre), that appeals to me. Ghost Rider and Hercules have a lot to discuss, I expect. I swear all Hercules ever says about/to Ghost Rider is that GR is a demon, and therefore untrustworthy. There are several Marvel series (and individual issues from other ongoing books) from the 1970s and early 80s that have never been collected in trade paperbacks due to them featuring various characters that are owned by other companies, i.e. Master of Kung Fu, Micronauts, Rom Spaceknight, Conan, Red Sonja, Doc Savage, among others. So it is actually very fortunate that Marvel managed to work out a deal with Toho Studios that enabled them to release an Essential Godzilla collection. As you say, these comics may not be brilliant or groundbreaking, but they are a lot of fun. I was surprised to find the whole Godzilla series in reprint, as you note. 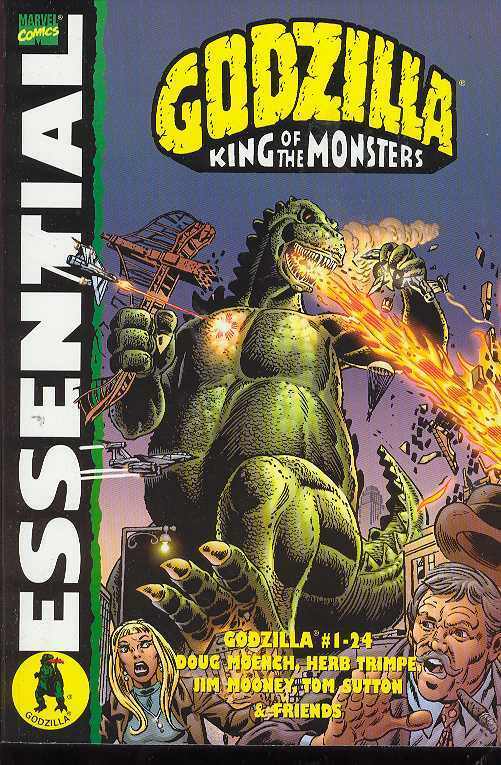 The Essentials line is going out of print, as a whole, but the Godzilla volume is still easily available on eBay. Those other titles you mention — that will likely never be reprinted — make up the core of the Longbox Graveyard collection!